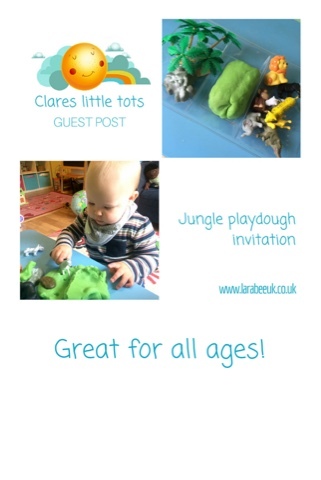 This week we have a fabulous playdough post for you from our good friends Clare's Little Tots. I love playdough invitations! T enjoys them as much now as he did when he was small and they are one of the first activities I did with him, probably after seeing them on Clare's Instagram feed! Anyhow, over to Clare, thanks so much for Being our guest, we love this activity and will definitely be re-creating it! Hi, I'm Clare from Clare's Little Tots I'm a mum to two and a childminder. 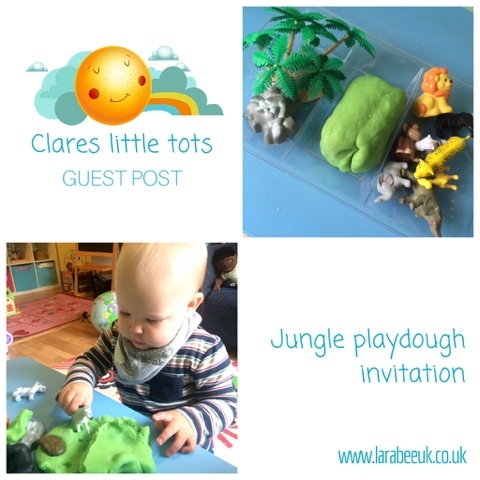 When Leandra asked if I wanted to do a jungle themed guest post for her I knew straight away that it would be Jungle Playdough. We play with playdough ALL the time here and it's popular with the babies I care for right through to the older school children. It's my go to activity to pull out when I have nothing else planned and we always have a batch on the go. I always make my own playdough as it's cheaper and I find it a lot softer and so easier to manipulate than shop brought playdough. My Little Tots love to help make it and my 4yr old now knows how to make it by herself (I just add the boiling water). 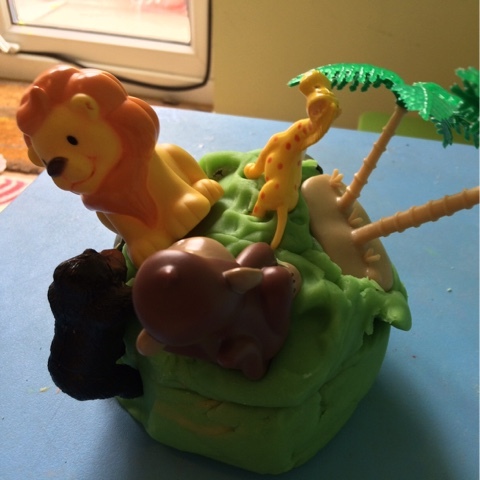 To make this jungle themed playdough I whipped up a batch of our easy no-cook playdough and added some green Wilton's food colouring (a squirt of paint also does the job). Once cooled I set the playdough out with some small animals, trees and pebbles and left for the Little Tots to explore. 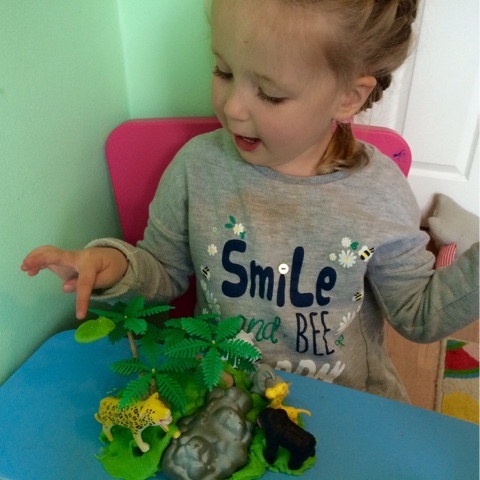 The 3 and 4 year old instantly set about creating a jungle together and inventing a story around the animals although they soon made their own jungles when they couldn't agree which animal was the best of all jungle animals. My 13month old was quite content to poke the playdough and make holes with his fingers before observing how the older children were playing with it. 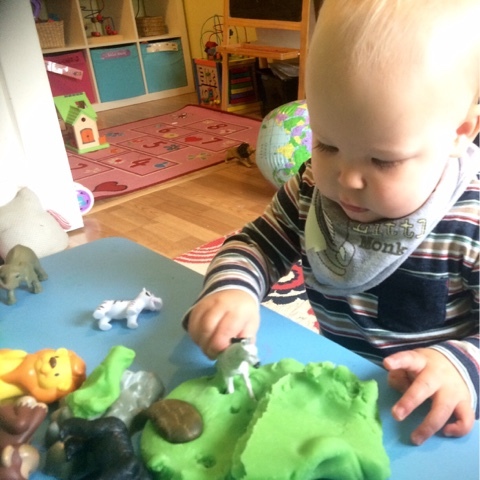 He then chose some animals and pushed them into the playdough over and over again and stopped to examine the marks it made. He also enjoyed hitting it as hard as he could which he found very amusing! The 2 year old I care for always hides things in playdough whenever we get it out, covering every last inch of the toy. Then when she's finished she enjoys pulling them all back out again and sometimes acts surprised at what's she's found. 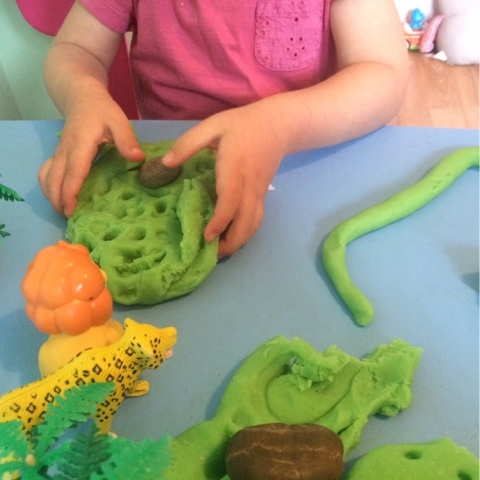 Playdough is a lovely group activity when you have multiple ages or even just to use as a bit of quiet time. 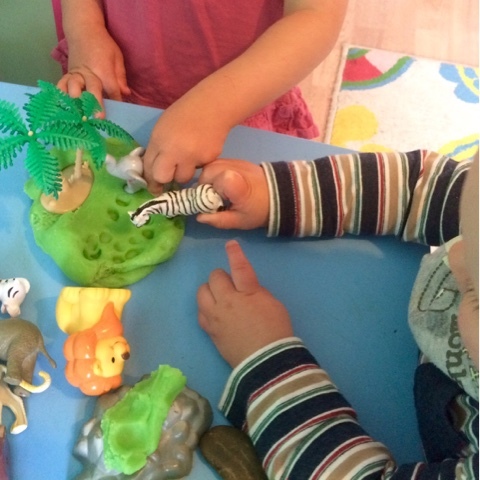 It's great to work those little hand muscles and helps children become involved in imaginative play and story telling. 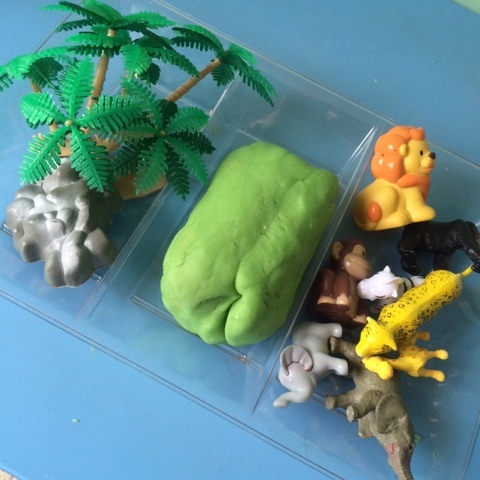 I've written a post on The Benefits of Playdough as it's one of my favourite resources. If your little ones love this why not check out some of our other playdough ideas that can be found here. And why not pop over to our social media accounts where I share lots more fun and easy activities suitable for babies, toddlers and preschoolers. Despite best efforts I can *never* get home made play dough right! Luckily we were given loads of shop bought playdoh so we have plenty of that to keep us going for now.